T7 Express lysY/Iq competent E.coli (C3013I) is available as a superior alternative to T7 Express Iq competent E.coli (C3016 ). The additional lysY gene expresses a phage T7 lysozyme variant that inhibits basal T7 RNA polymerase activity. The net result of employing lysY/Iq cells as a host strain is greater clone stability and equivalent or improved expression of recombinant protein. Enhanced BL21 E. Coli derivative, chemically competent E. coli cells suitable for high efficiency transformation and protein expression. T7-controlled expression of a non-toxic protein in E. coli hosts. A T7 expression plasmid containing a gene encoding an E. coli protein was transformed into each host, grown to 0.6 OD and induced for 3 hours. Comparison of soluble extracts from uninduced (-) and induced (+) cells shows superior control of basal expression in the T7 Express hosts while maintaining high levels of induced expression. * Ideally, DNA for transformation should be purified and resuspended in water or TE. However, up to 10 µl of DNA directly from a ligation mix can be used with only a two-fold loss of transformation efficiency. Where it is necessary to maximize the number of transformants (e.g. a library), a purification step, either a spin column or phenol/chloroform extraction and ethanol precipitation should be added. Effect of heat shock time on T7 Express Iq competent E.coli transformation efficiency: 50 μl of competent cells were transformed with 100 pg of pUC19 control DNA following the provided High Efficiency Transformation Protocol except heat shock time varied from 0 to 80 seconds. 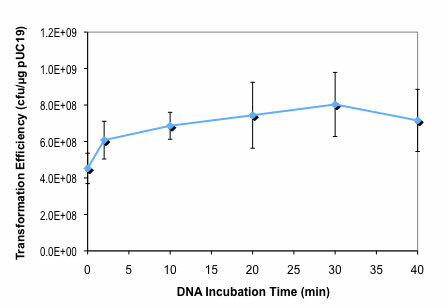 Effect of DNA incubation time on T7 Express Iq competent E.coli transformation efficiency: 50 μl of competent cells were transformed with 100 pg of pUC19 control DNA following the provided High Efficiency Transformation Protocol except DNA incubation time varied from 0 to 40 minutes. Why are there no colonies or no growth in liquid culture (C3016)? Why is there no protein visible on gel or no activity (C3016)? Why is induced protein insoluble (C3016)? What are the solutions/recipes (C3016)? What are the strain properties (C3016)? What is the difference between NEB #C3016H and NEB #C3016I? What is the optimal heat shock time for this strain (NEB #C3016H and NEB #C3016I)? Is T7 Express Iq (NEB #C3016H and NEB #C3016I) compatible with auto-induction procedures? What is the shelf life for this strain (NEB #C3016H and NEB #C3016I)?